It’s been a while since I have posted an update. My foundation repairs on the house and studio have been taking up a lot of time. I have however created a number of new collections that are ready for licensing. It’s been fun working in a brighter palette as on my last trip to the Atlanta Gift Show I really noticed how the colors are cheery and fun! 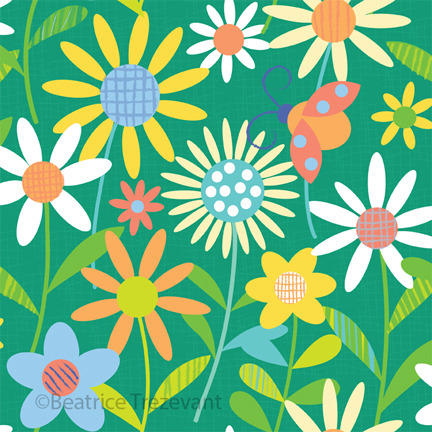 The piece below “ladybug with Flowers” is part of a collection that I’m working on right now. My focus now is to make the groups as exciting as possible while keeping the themes coherent. Of course scale, flipping out background colors, adding elements, playing with movement are all ways to accomplish the objective. Stay tuned for a lot of new design work and shared ideas this year. Trezevant Art, Blog at WordPress.com.